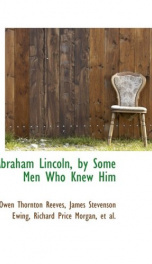 Abraham Lincoln: By Some Men Who Knew Him. Personal Recollections Of Judge Owen T. Reeves, Hon. James S. Ewing, Col. Richard P. Morgan, Judge Franklin Blades, John W. Bunn And An Introduction By Isaac Phillips. --This text refers to an alternate Paperback edition.